RADICAL will ease the fast creation of interoperable and socially‐aware services, by leveraging Internet of Things and Social Networking technologies, emerging from the results of four R&D EU‐funded projects: SmartSantander, BonFIRE, SocIoS, and +Spaces. 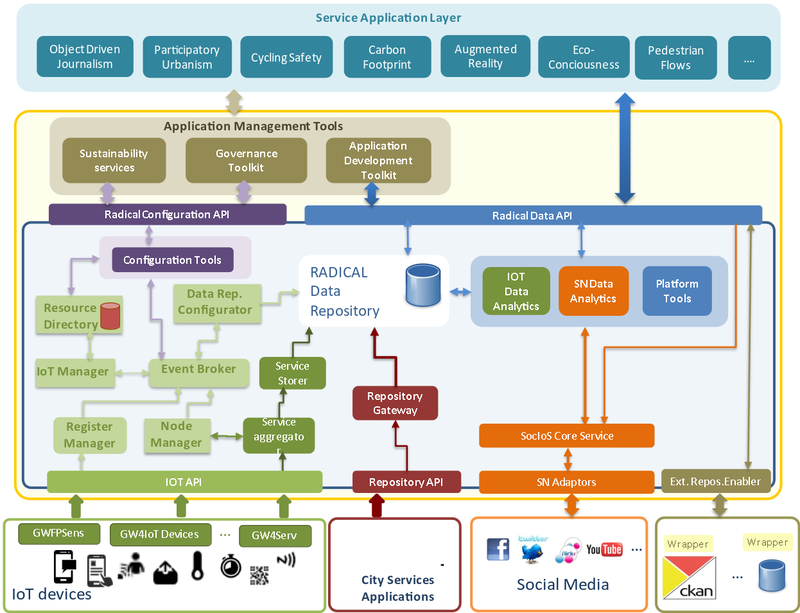 A number of services will be integrated, deployed and piloted on top of the RADICAL platform. This platform will also facilitate tools for the smart governance and flexible replication of services across cities and regions, thus shortening the time to market and allowing SMEs, citizens and local authorities to get fully involved in the smart city business. The RADICAL services belong to the areas of Cycling Safety, Green Products Management, Data Journalism, Participatory Urbanism, Augmented Reality and Eco‐consciousness. These services will be supported by five technical SMEs and accordingly replicated across five smart cities and one smart region. Over 2400 citizens will be actively involved in the co‐creation, validation and evaluation of the RADICAL approach, on the basis of the Living Lab methodology, which will engage users of the entire stakeholder chain. DKMS/NTUA was one of the main technology providers of the RADICAL project, contributing software libraries and knowhow associated with its SocIoS and +Spaces projects (where NTUA was the technical leader). NTUA’s primary role in the project was focused in the integration of these projects in the RADICAL platform. NTUA was in charge of the overall integration of the platform and of the development of the governance toolkit that facilitated interoperability and replicability. NTUA was in charge of the detailed specification of the various scenarios (and relevant KPIs), while also playing a role in the evaluation of the project’s platform from a technical, technological and usability perspective.